The central part of your automatic garage door system is the opener. This unit isn’t just responsible for controlling the movement of your door; it also contains many important safety and security features that help to keep your home and property safe. Our team has more than a decade’s worth of experience working with these complex machines, and we can quickly resolve any problems that your may be experiencing. In addition to this, we also supply and install new units from a wide range of industry-leading brands, including Genie, LiftMaster and Linear. Why Choose A New Model? Modern garage door opener models come equipped with a whole host of security and convenience features. Take the Chamberlain “MyQ” app for example. This lets you control your WiFi-enabled opener from virtually anywhere, just by using your smartphone or tablet. You can also defeat remote code-duplicating thieves by choosing a model that uses rolling code technology that generates a new code every time the door is used. In addition to this, modern models are faster, safer and more reliable than ever before - a new unit is a great upgrade for your home, both in terms of security and safety. If you’re not sure which unit is right for you, our team will happily give you all the advice you need. Generally, the first thing to decide is which drive system to go for; do you want a reliable and affordable chain drive, or a near-silent belt drive? Perhaps you’d rather keep maintenance to a minimum – in which case a screw drive unit is probably the best choice for you. No matter what you need, our technicians will ensure your chosen opener is appropriate for your situation and needs. It’s crucial to make sure that your new system is installed correctly - openers need to work perfectly with every other part of the garage door system, and must be very carefully calibrated. Our team will make sure your new unit is secured to overhead blocking before attaching the trolley and rail. We’ll then test the drive system, set the limit switches, check the door's balance and ensure your safety sensors are properly adjusted. We’re always happy to discuss your requirements. Whether you need a new opener, or your existing model has developed a fault and needs to be fixed, our team is ready to help. 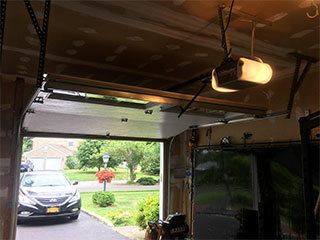 Contact Garage Door Repair Darien today to schedule an appointment.